(Phys.org)—A team of researchers with the University of California has developed a new technique for converting sugarcane biomass into jet fuel that they claim reduces greenhouse gas emissions by 80 percent. In their paper published in Proceedings of the National Academy of Sciences, the team describes their process and their hopes that it can eventually be used to power aircraft. Over the past couple of decades, researchers have put a lot of time, money and effort into finding alternatives to petroleum based fuels, partly as a result of petroleum price fluctuations and partly as a means of reducing greenhouse gas emissions. Such efforts have resulted in the development of a wide variety of fuels, many of which are now being put to a wide variety of uses. One notable exception has been jet fuel (which contributes a reported 2 percent of all carbon emissions into the atmosphere), due to its more stringent requirements. In this new effort, the researchers describe a technique they have developed (with funding from BP) that allows for developing fuel that meets the requirements for jet aircraft. Efforts to create a cleaner jet fuel have intensified only over the past decade, thus such fuel research is still in its infancy, those created thus far have been approved for use as recently as 2011. For fuel to be useful in jets, it must be free of oxygen, because it adds mass that is not used as fuel, thus, it does nothing but take up precious space in gas tanks. The fuel must also be stable at extremely low temperatures, i.e. not gel at high altitude temperatures in the -40C range. It must also have just the right boiling point and certain degree of lubricity so it will not cause wear on turbines. 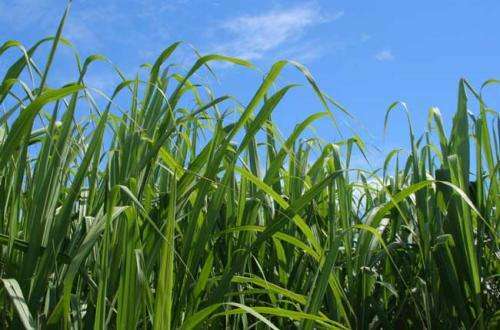 Another problem with developing fuel from plant matter is the problem of converting crop land to use for fuel, that is why the researchers with this new effort chose sugarcane. The process involves separating out the sucrose in sugarcane which is then used to derive methyl ketones which then serve as building blocks for the fuel that is eventually produced. The same method, the researchers report, can also be used to create lubricants for use in automobiles and diesel fuel. Decarbonizing the transportation sector is critical to achieving global climate change mitigation. Although biofuels will play an important role in conventional gasoline and diesel applications, bioderived solutions are particularly important in jet fuels and lubricants, for which no other viable renewable alternatives exist. Producing compounds for jet fuel and lubricant base oil applications often requires upgrading fermentation products, such as alcohols and ketones, to reach the appropriate molecular-weight range. Ketones possess both electrophilic and nucleophilic functionality, which allows them to be used as building blocks similar to alkenes and aromatics in a petroleum refining complex. Here, we develop a method for selectively upgrading biomass-derived alkyl methyl ketones with >95% yields into trimer condensates, which can then be hydrodeoxygenated in near-quantitative yields to give a new class of cycloalkane compounds. The basic chemistry developed here can be tailored for aviation fuels as well as lubricants by changing the production strategy. We also demonstrate that a sugarcane biorefinery could use natural synergies between various routes to produce a mixture of lubricant base oils and jet fuels that achieve net life-cycle greenhouse gas savings of up to 80%. Why? Is there a bunch of sugarcane going to waste somewhere?